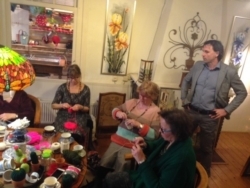 Pincvision sponsors grannies from Doetinchem to make baby beanies for Malawi! Edo Bosga (Pincvision) met up with Mariël Kampshoff (Blend) and she told him about her company Blend putting effort into the increase of social involvement for elderly people in Doetinchem. One of the activities organized by Blend is a knitting club, a good opportunity for elderly people to get out of their homes and have fun together. Pincvision has been sponsoring The Childrens Fund of Malawi for years now, a foundation that gives orphans a chance to go to school and teach them a profession so they can take care of themselves and build up a good life. When Edo heard Mariël’s story, he had the idea of combining these two charities. You might think, what do people in Malawi need beanies for? Well, even though the temperature is often very high, there are a lot of cold winter nights too. Babies are kept warm by using blankets and using the body temperature of their mothers, but the heads of the babies are in need of protection against the cold too. Ten grannies have been putting a lot of love and effort into knitting 100 warm baby beanies in the last 6 weeks. 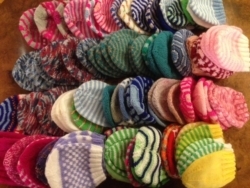 The wool they used for making the beanies is mostly obtained from donations. In comparison for making the beanies, Pincvision has sponsored an amount of money from which Blend can organize a nice activity for the grannies. A win-win situation! The beanies will be sent to Malawi as soon as possible. They will be receiving them happily because the cold winter weather is knocking on the door.